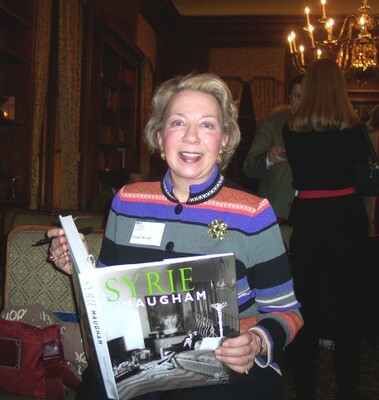 Historian, author, and Historic New England Council member Pauline Metcalf gave atalk to members of the Ogden Codman Design Group and guests on February 17.Forty-three attendees enjoyed a visual and audio presentation about the Britishdesigner Syrie Maugham, the subject of Miss Metcalf’s latest publication, Syrie Maugham: Staging the GlamorousInterior. The talk was held in the library designed by Ogden Codman atthe Hampshire House, located on Beacon Hill in Boston. Guests enjoyed a reception and booksigning following the talk. In addition to being an interior designer, Syrie Maugham wasa trendsetter, fashion icon, and wife of author W. Somerset Maugham. She popularized the all-white movement ininterior décor of the 1920s and 30s, and is largely credited with influencing thehigh-style trend and Hollywood glamourassociated with the 1930s. This event was hosted by the Ogden Codman Design Group, aspecial Historic New England membership for design professionals andenthusiasts. Learn more.